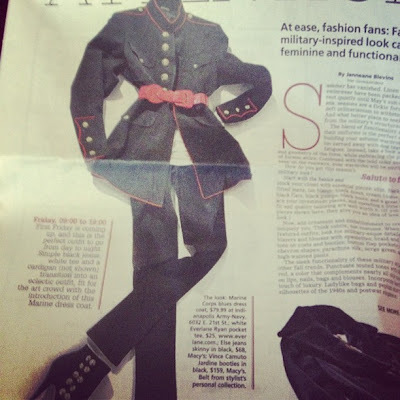 I'm not a fashion blogger, nor do I claim to be any type of expert when it comes to fashion...but I am a Marine wife, and as a Marine wife, I was SHOCKED to see the following picture in my local newspaper in an article talking about the trend of military inspired fashion. I'm not sure how clearly you can see it in the photo, but this is not just a military inspired jacket, but an actual Marine Corps dress blues jacket...even going as far as to tell you the military surplus store to buy one. If you have no affiliation with the Marine Corps, or the military in general, you may not see the problem here. To be honest, before marrying my husband I might not have thought anything of it either, but I know better now. See, the Marine Corps uniform is not just any outfit...it is something that is earned. Unlike some other branches, you are not a Marine until you have finished boot camp. Ever heard the expression 'earned, never given'? And not only have they earned the title Marine, but they've also earned the right to wear this uniform. A fun fact for you, even in films the uniforms are never exact...they may be close but there is always something slightly off! So, while the writer of this article, and many others who use actual military uniforms as a fashion statement may not see the harm, and may even in fact be attempting to honor our military, they are instead doing the exact opposite. There's nothing wrong with military inspired pieces in your wardrobe...but if you want to wear the actual uniform, go talk to your local Marine Corps recruiter (like my hubby) and earn that right first. And leave the real deal to the Marines! Thanks for the article ! It was very informative as ive been reading into where i can get military fatigues for a movie im shooting, thanks again for the info!